Looking for inspiration, business tips, ideas for how to get the most out of Practice Ignition? check this article out on where to ask. The Facebook group is a fantastic place to ask for help from other users around best practices. If you have specific technical support questions, please use the conversation or email option or fill out the technical support request form. Please note, this group is for subscribers only, and you'll be asked to request access before you can join the group. If you have been introduced to an account manager, reach out to them directly. the PI account management team are all experts in the professional services field. 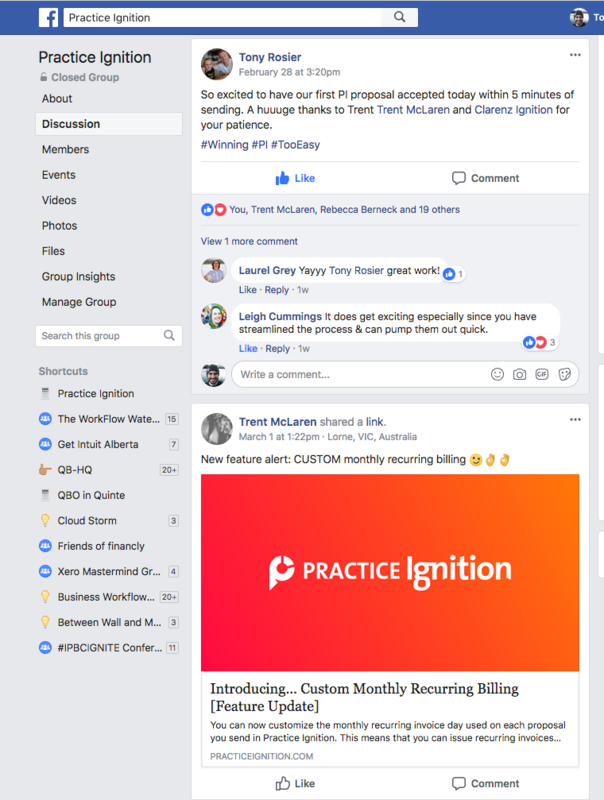 Each team member has real world experience in managing a professional services firm, and they've spoken to thousands of Practice Ignition customers to extract and share some of the most innovative solutions to problems businesses of all sized have faced. If you haven't been connected to an Account Manager, reach out to the support team and they will put you in touch with the appropriate person. Watch a Practice Ignition Webinar.